The fire was estimated at 15½ square miles early Thursday, growing from 6,000 acres late Wednesday, with zero percent containment. BANNING, Calif. — A thousand firefighters battled a growing wildfire in the inland mountains of Southern California early Thursday, trying to save small communities where some homes have been lost and an estimated 1,500 residents were forced to flee. 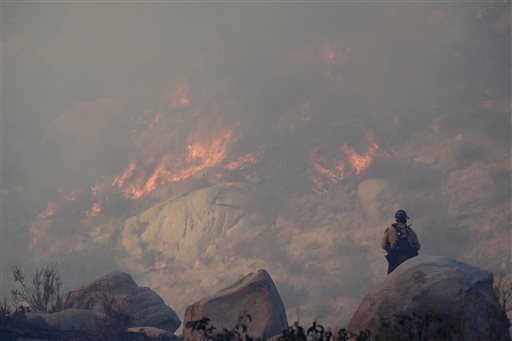 Flames roiled along foothills of the San Jacinto Mountains in Banning Pass 90 miles east of Los Angeles. The fire moved eastward, pushed by a steady wind from the west, said Julie Hutchinson, spokeswoman for the California Department of Forestry and Fire Protection. The fire was estimated at 15½ square miles early Thursday, growing from 6,000 acres late Wednesday to 10,000 acres overnight, with zero percent containment. Fire officials estimated 15 structures burned, but could not say how many were homes. TV news helicopters and photos from the scene showed several houses in flames. They included the Twin Pines home of Dave Clark, whose parents were killed in a house fire in the city of Riverside in April 2012, the Riverside Press-Enterprise reported. Prosecutors alleged Clark’s sister Deborah Clark set that fire, and she was awaiting a mental-competency hearing to see if she was competent to stand trial for her parents’ deaths. A photograph taken by the Desert Sun newspaper showed Clark talking on his cellphone with the home fully engulfed in flames behind him. “He said he lost everything, he couldn’t talk,” brother Jeff Clark told the Press-Enterprise. Evacuation orders covered the Silent Valley Club, a private RV resort, the rural communities of Poppet Flats, Twin Pines, Edna Valley and Vista Grande, and portions of Cabazon, a city along Interstate 10 at the base of the mountain range. Evacuation centers were set up at high schools in Hemet and Banning. Margaret Runnels of Poppet Flats was at work when her house came under an evacuation order. She was in Banning waiting for her husband to collect pets and valuables from their house. 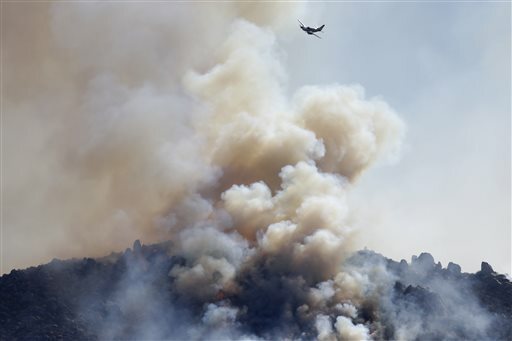 Thirteen helicopters and six air tankers were assigned to the blaze. Most of Southern California’s severe wildfires are associated with Santa Ana winds caused by high pressure over the West that sends a clockwise flow of air rushing down into the region. This week’s fire, however, was being fanned by a counter-clockwise flow around a low pressure area over northwest California. 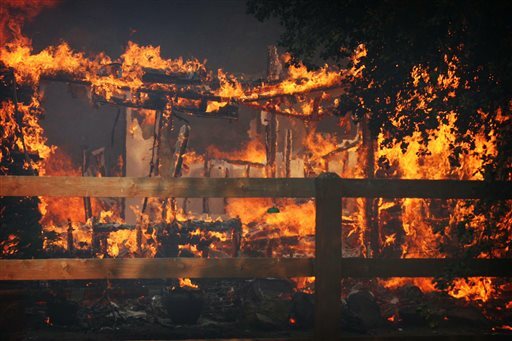 The latest fire also burned in the footprint of the notorious Esperanza Fire, a 2006, wind-driven inferno that overran a U.S. Forest Service engine crew defending a Twin Pines home. All five crew members died. A local man was convicted of murder and arson for starting the fire on a Cabazon hillside and was sentenced to death.